Posted June 18th, 2010 at 12:11 pm | Log in to reply. Can i put in the syrup if i want to keep the cookies in a container for a few days? Can i use the corn syrup instead? thank you for your lovely and easy recipe! Posted June 18th, 2010 at 1:36 pm | Log in to reply. no, after dipping the cookies in syrup, you have to take them out and keep them in an air tight container before putting them in the fridge. Otherwise, the cookies will get soggy. Posted June 8th, 2010 at 10:30 am | Log in to reply. Posted June 8th, 2010 at 5:25 pm | Log in to reply. Add some more water then. When you knead by hand, it will take more time and patience. Posted May 20th, 2010 at 9:51 pm | Log in to reply. oh and maangchi is the pine nuts you were using raw? Posted May 21st, 2010 at 10:15 am | Log in to reply. yes, they are raw pine nuts. Posted May 16th, 2010 at 10:56 pm | Log in to reply. Maangchi! It took me so long to cook these. I didn’t actually use the full recipe, but I featured it in my Foodie Fight competition entry! I fried fun-shaped wonton wrappers and coated them in delicious syrup. Next time, I will follow your recipe–it must be more delicious to have the ginger in the dough, like you do! Posted May 17th, 2010 at 6:50 am | Log in to reply. Posted May 8th, 2010 at 12:39 pm | Log in to reply. Posted April 28th, 2010 at 10:41 am | Log in to reply. I tried this recipe last night, my whole family loved it! Im pleased that the ingredients are easy to find, and the c=recipes are clear. Ill be sure to try more of your recipes! Posted April 11th, 2010 at 2:35 am | Log in to reply. we just don’t use ginger in the dough, but cinnamon powder or orange flower water, and in place of the pine nuts we use sesame seeds. it’s a cookie we make for celebrations. Posted April 12th, 2010 at 10:15 am | Log in to reply. Wow there are so many similar foods in the world, but this mawjakwa really seems to be international. “4 slits and we do a double ribon ” I should try it out! thank you for sharing your culture relating to this recipe. Posted February 7th, 2016 at 12:24 pm | Log in to reply. Also there is something like this in Poland too and its called faworki! Usually its made for the last Thursday of carnival. During that day along the faworki we also eat a lot of doughnuts. We don’t use ginger in our cookies and instead of a syrup we just sprinkle them with a powdered sugar. Posted April 8th, 2010 at 9:56 am | Log in to reply. can I use peanuts or any other nut to substitute for pine nuts? Posted April 8th, 2010 at 9:59 am | Log in to reply. Posted April 8th, 2010 at 10:30 am | Log in to reply. Peanuts sounds good to me! thank you! Posted March 29th, 2010 at 4:09 pm | Log in to reply. I have a question, if you don’t have something to grind the ginger in or to squeeze the juice out, what other methods or tecniques could you possibly use? Also, would it taste okay if I don’t use ginger? Posted March 30th, 2010 at 10:11 pm | Log in to reply. Whatever method you use, crush ginger to get a little juice! That’s your job! : ) Ginger gives this cookie good flavor,but if you don’t like to use ginger, skip it. Posted March 16th, 2010 at 7:53 pm | Log in to reply. hello (: i was just curious, does the syrup coating on the cookies turn hard like toffee afterwards? or does it stay wet and sticky? Posted March 17th, 2010 at 7:45 am | Log in to reply. a little sticky but not wet so that the cookies remain crispy for a couple of days. Posted February 20th, 2010 at 3:05 pm | Log in to reply. In Poland we have very similar cookies. They are called “chrust” or “faworki” or “jaworki”- it depends on the region, and are usually eaten on the Fat Thursday. The dough is made from flour, a lot of eggs, sugar, small amount of fat and a little bit of vinegar, some recipes also consist bear :). They are also deep fried and you also cut them and fold into a ribbon shape, and then you dust it with powdered sugar. Posted February 20th, 2010 at 3:07 pm | Log in to reply. Posted February 21st, 2010 at 3:02 am | Log in to reply. lol, nobody will think you meant bear. : ) “Culture may be different, but food unites people.” I agree! Posted December 21st, 2011 at 8:18 pm | Log in to reply. Posted February 5th, 2010 at 3:11 am | Log in to reply. Do you have the recipe of using ginger into sweets like what have been shown in Jewel in the Palace? This was serve to the king when what was left in the storeroom was only ginger and lotus roots. 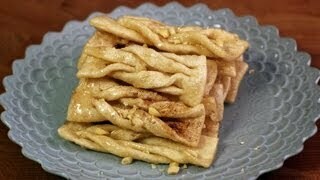 Also, can you show how to make rice cakes like what have been broadcasting in Arirang TV. Posted February 5th, 2010 at 7:13 am | Log in to reply. I don’t know the answer because I did not see the dramas. You need to leave more detailed description about the food. Posted January 14th, 2010 at 3:02 am | Log in to reply. Posted February 5th, 2010 at 7:14 am | Log in to reply. Posted January 3rd, 2010 at 4:55 pm | Log in to reply. Hello I am a student from Punahou. I had to make a cookie or quick bread FOR my home-ec project. THANK YOU so much for the recipe. Posted January 8th, 2010 at 10:36 pm | Log in to reply. how’d your cookies come out? Posted January 9th, 2010 at 8:22 am | Log in to reply. How can I make you 2 make friends each other! : ) HeSeung, answer Kaysea,plz. Posted January 2nd, 2010 at 1:32 am | Log in to reply. I have been watching all of your videos ever since I found you on youtube by accident, I love all of your recipes, I made these and some of the rainbow ricecake for my korean mother. She loved them both! Thank you so much for the recipes. I was wondering if you would also happen to know how to make 밤빵?? The little baked pastries that look like chestnuts. My 이모 won’t show me how to make it, she says she wants to keep it a secret, haha. Posted January 2nd, 2010 at 3:32 am | Log in to reply. Yes, I will include it to the list of my upcoming recipes. The video was watched 331,791 times on YouTube & has 3,108 likes!